Looking up at the Moon, you might notice it’s crisscrossed by bright streaks that originate from some of the younger craters that cover the surface. These are known as crater rays, and they can be found on many planetary bodies, including the Moon, Mars, Mercury, and several icy satellites. Given that the rays trace back to a crater, it seems reasonable that they were made by material that was blasted out of the crater, called ejecta, which then fell back down onto the surface some distance away. 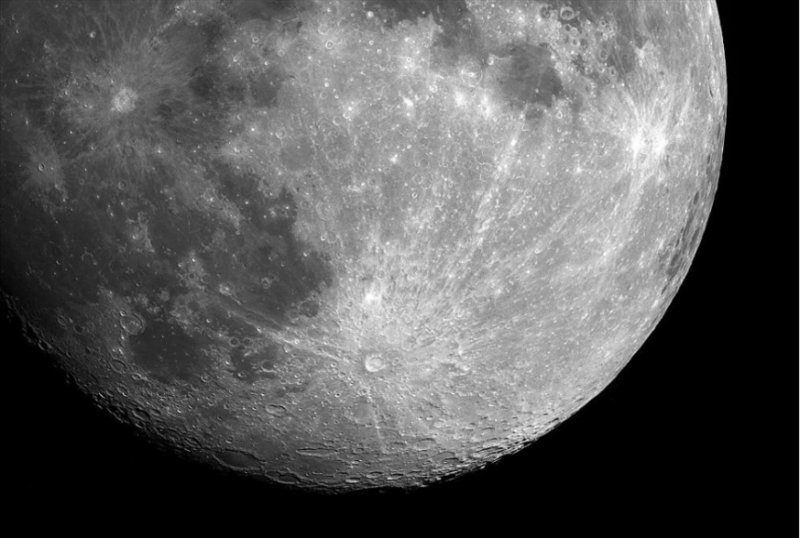 In the case of the Tycho crater, its rays wrap around the entire surface of the Moon. The lengths of crater rays on the Moon were first measured by Ralph Baldwin, a prominent astronomer-turned-planetary-scientist, in his 1963 book, The Measure of the Moon. These ray length measurements were made with Ranger VII (the first US space probe to capture close images of the Moon), using images that are roughly 300 meters per pixel (m/px for short). A while later in 1974, Henry Moore of the U.S. Geological Survey fit an equation to these measurements but seemingly mistook Baldwin’s measure of the diameter of the entire ray system surrounding the crater for the length of an individual ray, leading to an overprediction of ray length that has persisted for decades. The ray length equation by Moore was simply a fit to observational data; no attempt was made to understand the process by which these rays were crated. Furthermore, the smallest crater measured by Baldwin was roughly 3-kilometers in diameter. This empirical fit may not apply to smaller craters, which are much more numerous than kilometer-sized craters are. These small craters may play an important role in moving material across the Moon. To better explain material transport across the Moon’s surface, we set out to improve the measurement of ray lengths of several craters, especially smaller craters not readily visible with 1970s observations, in order to better constrain the relationship between crater size a ray distance. Using images that are 100 m/px and 0.50 m/px (quite the improvement over the 1970s technology), we mapped 27 crater ray systems and over 300 individual rays. We found that our new measurement of rays corresponded quite well with Baldwin’s measurements of ray lengths from larger craters from over 50 years ago and confirmed that rays grow proportionally larger with increasing crater size: a 100-meter-wide crater may have rays that are 10 times the size of the crater, but a 1,000-meter wide crater possesses rays that are 15 times the size of the crater. With more modern lunar spacecraft images, we were able to determine that very small craters (<100-meters in diameter) had rays proportionally much longer than larger craters. This is the opposite trend than what is predicted by Moore, in which rays become proportionally longer with increasing crater size. This leads us to infer that small and large craters undergo different ejecta processes. Close-ups of rays at high-resolution reveal they are a cluster of secondary craters which formed from the ejecta itself. Towards the edges and the end of rays, the density of these secondary craters, and thus the distribution of ejected material, thins out until it is indistinguishable from the lunar background. Given that both the secondary craters and their surrounding ejecta blankets are bright, we hypothesize that these secondary craters are excavating bright material buried beneath the Moon’s dark surface. It has already been established that the lunar surface darkens over time in a process called “space weathering,” due to the intense radiation and impacts of very tiny dust grains. This space weathering has created a thin dark layer at the surface of the moon. The bright material seen in rays is in stark contrast to the dark lunar background. When viewed from a distance, the field of craters appears as one bright patch, creating the visible rays that we see. This conclusion is consistent with the observations that crater rays are notably more visible for the youngest craters. We then set out to develop a physical explanation for these trends. While a process of bigger impacts leading to higher ejecta velocities, and thus more distant secondary craters, works well to explain why larger craters (> 100-meters in radius) have proportionally longer rays, it does not explain why smaller craters are found to have rays that are proportionally as long as the biggest craters. We surmise that a different mechanism may cause rays associated with smaller crates to be bright. Rather than excavating material from beneath the surface, ejecta from small craters is traveling so slow that it simply sits atop the dark surface. We calculate that the bright rays of small craters are formed by material traveling less than 50 meters per second, much too slow to excavate secondary craters. This leads us to propose three regimes in which rays exist. In the first regime, ejecta is traveling so slowly that it does not excavate subsurface material. Instead, it simply sits atop the surface. This is the regime that small craters (< 100-meters) exist in. For larger craters (> 100-meters), ejecta excavates secondary craters exposing bright material from beneath the surface. In the final regime, ejecta is traveling fast enough to trigger excavation, but the amount of ejecta is so small that it cannot excavate beneath the dark surface layer. This regime defines where crater rays lose their visibility. This last regime has important implications for material transport, as it implies that ejecta from an impact can transport material far beyond the end of the visible rays, leading to enhanced transport and mixing on a more global scale than previously recognized. These findings are published in the open-access article entitled The length of lunar crater rays explained using secondary crater scaling, recently published in the journal Icarus. This work was conducted by Jacob R. Elliott, Ya-Huei Huang, David A. Minton, and Andrew M. Freed of Purdue University. David earned his BS degree in Aerospace Engineering from NC State in 2003 and his PhD from the University of Arizona's Lunar and Planetary Laboratory in 2009. Under the tutelage of Prof. Renu Malhotra, he learned about the beauty of orbital mechanics and how we can use the dynamics of small body populations to infer the history of the early solar system. 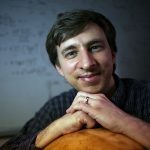 Following his PhD, he worked as a postdoc at the Southwest Research Institute in Boulder, where with Hal Levison and Bill Bottke he explored the formation and early evolution of the solar system. David joined EAPS in 2011, where his research group works on a variety of projects involving the history of the early solar system, the formation of satellites, the cratering history of airless bodies, and the physical and dynamical evolution of asteroids and comets. Andy received his PhD from the U. of Arizona in 1998, and after postdoc stints at UC Berkeley and The Carnegie Institution of Washington, joined EAPS in 2003. Andy’s research utilizes numerical modeling to understand a variety of time-dependent geodynamical processes that involve viscous flow and conductive cooling, including terrestrial projects dealing with crustal and mantle rheology, postseismic processes, and earthquake triggering, and planetary projects such as the full evolution of impact basins from transient crater formation through isostatic adjustment and faulting associated with lava emplacement and cooling.